For 2013, Cadillac, Michigan-based Four Winns offers a total of thirty-five models of runabouts, cuddy cabins, deck boats, and cruisers from eighteen to forty-seven feet in six series. The Sundowner® S235 is the larger of two cuddy cabins offered – the other being the S215. The “SS” designation stands for “Signature Series” that adds even more standard upgrades to the base model to make this boat really noticeable and special. There are four immediate very obvious visual clues that will identify this boat as a Signature Series when you first approach it. 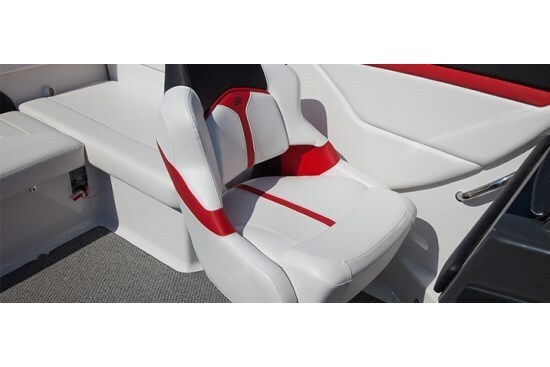 The first will be its standard Signature Series hull graphics with a jet black hull bottom and stern section combined with a bright red boot stripe even extending along the edge of the integrated swim platform with the balance of the hull and deck in vibrant white. The second clue will be the low profile tinted windscreen, although this may be optionally exchanged for a normal aluminum-framed windshield. Third, you may notice the standard soft pad covering the swim platform, and fourth, you cannot help but notice (and hear?) the standard Quick & Quiet thru-hull (side) exhaust. The S235 SS runs on Four Winns’ proven Stable Vee® running surface. A starboard side transom walk-thru leads from the swim platform to the cockpit past the standard double-wide sundeck pad. This sundeck has a “kick-up” headrest to convert it into a chaise lounge. The fiberglass lined cockpit comes standard with snap-in cockpit carpet which may be optioned up to the vibrant graphics of Signature Series carpet. Cockpit courtesy lighting is blue; beverage holders are stainless steel. L-shaped lounge seating is provided along the port side and transom of the cockpit while two “ComfortRide” bucket seats with flip-up bolsters provide seating at the driver and passenger helms. The Aquaflex® white and Silvertex® color vinyl is given a carbon fibre texture in the SS. Storage is found throughout the cockpit including under the lounge seating and sundeck. A cockpit table with side-mount bracket is standard and a galley/refreshment centre in the cockpit plus stern shower are optional. 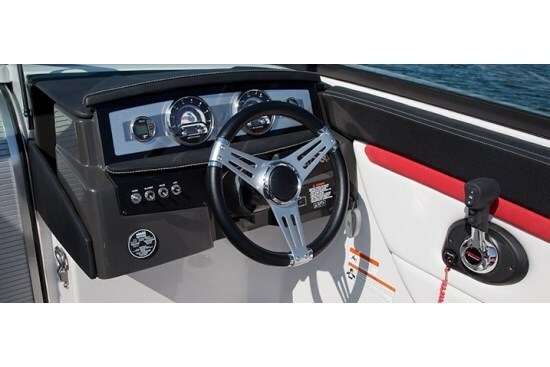 Both helms are covered with “precision textured trim, rich, handfitted, top-stitched upholstery.” The passenger side helm features a lockable glove box and storage for small electronics. The driver’s dash utilizes Faria fog-resistant gauges with polished raised bezels containing all of the normal sterndrive instrumentation plus an hour meter built into the tachometer, and a depth sounder with shallow water alarm, water and air temperature. A tilt deluxe steering wheel is standard. One slick option you may want to consider here is the helm Command Center with an LCD touch screen giving you, in addition to all of the instrumentation noted above, cruise control with programmable watersport rider settings, GPS/chartplotter, fuel flow, trip data, stereo control, and video inputs. The cuddy in the S235 SS is basic and functional with decent headroom, storage, an overhead, translucent, screened circular hatch, and is a great place for sitting out of the weather, changing, for afternoon snoozes, or even for overnighting. The cabin entry door is a lockable roll-up. A porta-potti beneath the centre cuddy cushion is optional. A Sony® AM/FM/CD player with iPod®/MP3 port is standard. 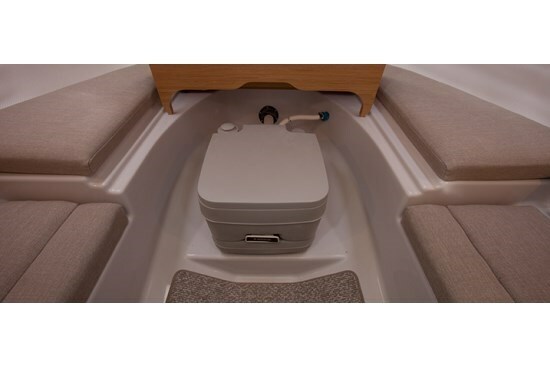 You can option up to a premium system with amplifier, subwoofer, speaker upgrade, transom speakers, and a stereo remote with or without display at either the transom or the helm or both. Other notable options available include adding a hinged watersports arch with or without speakers to complement the standard ski-tow. This arch comes with a color-matched bimini top. You can outfit your S235 SS with high profile stainless steel bowrails, foredeck sunpads, underwater lighting, and even an anchor windlass with rope and chain. A custom-matched Four Winns tandem axle trailer is standard and may be upgraded or even deleted if you don’t want one. A bimini top is standard and you may add a full camper enclosure and/or a cockpit cover. Choose from either Volvo Penta® Duo-Prop or MerCruiser® Bravo III V-8 sterndrive power from 300 to 380 horsepower with or without digital electronic (fly-by-wire) controls in both cases. If you’re looking for a fast, sleek, good looking cuddy cabin that stands out, this S235 SS just may be your ticket.